Step up to a machine that won't hold you back. The new BERNINA 3 Series machines lead the way in both design and technology. 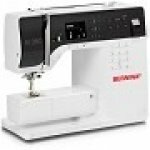 The alluring, comtemporary style sets a new benchmark in the work of sewing machine and in the home of every sewer, from ambitious beginner to advancing sewer and quilter. A multitude of simple to use, thoughtfully designed features and functions make it easy to fall in love with these machines.